IntroductionAn energy crisis is looming over the world. Many countries are doing their bit by adopting the sustainable solutions which are beneficial for long term. Many other countries are pulling out from energy and climate convention to go back to the same non-renewable energy sources, which have harmful effects on the environment. Renewable energy sources are the future of the planet, and they can only save the planet from the total destruction. Our demand for energy is continuously rising, and we have to find alternative sources of energy.Solar, wind and geothermal are only a few of the many alternative sources of energy available in the market. The renewable energy development is being taken on the fast forward basis in many countries, while many other countries are still missing their target. One of the key reasons is the amount of investment required in the infrastructure development for the adoption of the latest technologies, and the required know how to complete those projects. To reach the stage of self-management and development, many countries need an external agency to help them reach the next level. WPP is the renewable energy service provider. It has multiple projects in the pipeline, and with the integration of the blockchain technology, it aims to bring monumental changes in the ongoing green projects. Solar projects, hydro projects, and different government contracts are being carried out with the help of blockchain technology. They are targeting the developing countries and especially African countries. Their green energy platform is a visionary project that aims to bring all the green energy producers on a common platform and solve the impending crisis in the energy market. Organizations, governments, and individuals can participate in the project and contribute their resources to make this project a successful initiative. 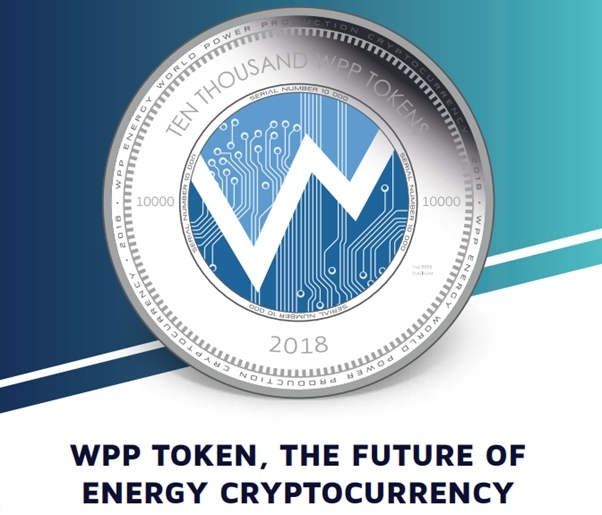 Another innovative initiative of the WPP ENERGY is the cryptocurrency exchange involving trading of energy tokens. Energy projects will be able to trade their cryptocurrency on the exchange and raise funds for their projects. The third product offered by the team is the mobile power station. To solve the immediate power needs in many remote parts of the world, this portable power solution can be a great replacement. It will be easier to operate, lower cost and environmentally safe. This can also be used for crypto mining as well as military use. 5 billion WPP tokens are created for the projects. 50% of the tokens are reserved for the token sale. A private sale is currently live until 1^st^ July 2018. The main token sale will start on 7^th^ September 2018 and continue until 7^th^ December 2018. The funds will be utilized in the developmetn and marketing of the platform. 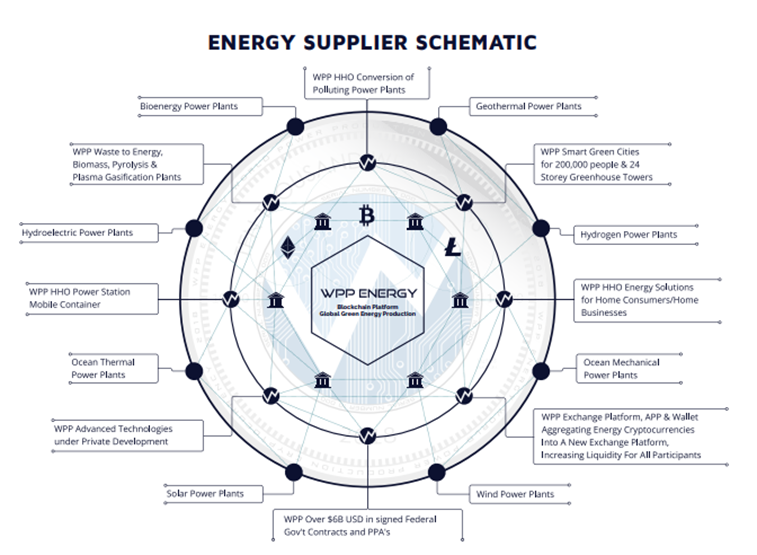 The team working on the project is experienced in the fields of blockchain and energy management. Air pollution is the major cause of death in many countries, and one of the primary causes are the traditional power plants which are still using the non-renewable energy sources. The shift from the non-renewable to renewable has to be gradual and steady. Tools needed to make this change are already being developed by the companies, and it is time to adopt these changes for the better future of the citizens. Geothermal, solar, wind, hydroelectric and biomass are a few of the many types of green energy solutions presented on the platform. Reducing the cost of domestic electricity in many developing countries with the help of green energy solutions is the aim of the platform. We need to invest in the green solutions for better tomorrow. Cheap electricity based on the renewable energy sources is the aim of the platform. Bringing cryptocurrency and blockchain technology into the green energy market has given a big boost to the entire ecosystem. Do you think that people will adopt the changes suggested by the platform?